Question: What is the answer to the equation nine to the ninth power of nine (9^9^9)? The answer to the equation 9^9^9 is a sequence of 78 integers (19.5 x 4). These integers are partitioned into groups of three or triads, the same way the Neteru are grouped in threes. There are 26 groups of three that align with the 26 phonetics of the English alphabet system. 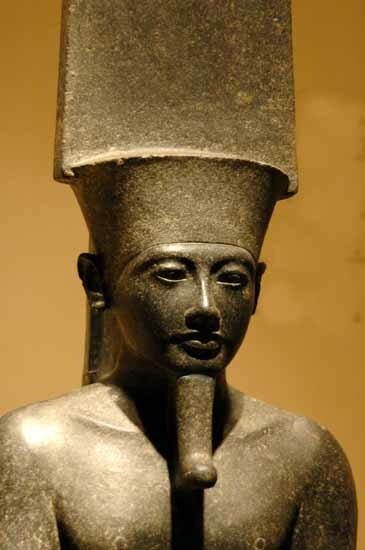 The two-center seeking English phonetics are the letters M and N, which produce the sound emen or AMEN (Amun). The two-center phonetics on either side of the letters M and N are the letters G and T. The letter G signifies the spiral or the whirling power of spirit (breath). The letter T signifies the zero of potential or simply the means to ground the whirling power of spirit. For example, TREES are organic grounds (zero of potential). Moreover, the answer to the equation 9^9^9 can be positioned in such a way that the 26 groups forms a phonetic-numeric cross centering on the phonetic-numeric sequences: 618-G and 315-T. The former is the reciprocal of PHI (.618) and the latter is PI (3.15). Question: Define reciprocal PHI and PI and how do they relate to the answer to the equation 9^9^9? Reciprocal PHI is the natural science of harmonic compression. 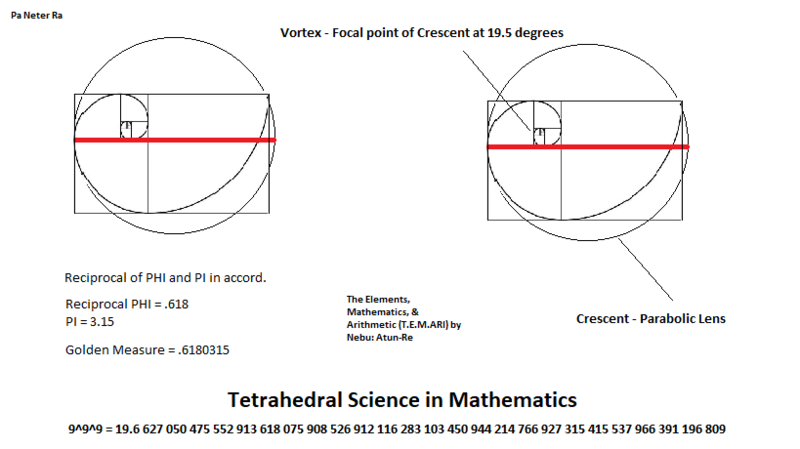 PI is the natural science of harmonic expansion. The Golden Section is the ratio between two portions of a line in that the lesser of the two is to the greater as the greater is to the whole. PI is the relationship of a circle's circumference with its diameter (line segment). Together, reciprocal PHI and PI forms the Golden Section or Reciprocal PHI: point 6180315 (Golden measure). This unique interaction with reciprocal PHI and PI reveals that they are complementary in meaning. The product of reciprocal PHI and PI offers some in sight into the nature of the answer to the equation 9^9^9. The entire 78 integer sequence is a harmonic approximation of the product of reciprocal PHI and PI. Remember, the value for PI varied (3.0 to 3.2) from culture to culture over the course of human history. Last edited by Pa Neter Ra; at 05:41 PM.. Question: Is the golden section part of everything? The Golden section, golden mean, golden spiral, golden ratio, etc., is known for its frequent appearance in geometry, mathematics, biology, economics, etc. Reciprocal PHI, for example, is basically point 618. This value is part of the answer to the equation 9^9^9 and is assigned the 7th letter made in the English alphabet (G), the sign for the spiral or helix. Moreover, the value for reciprocal PHI is a multiple of the number 103. It is also a member of the answer to the equation 9^9^9. The value 103 is the alpha-numeric value for the word NUWAUBU, which is the Science of Sound Right Reason, Science of growth (nuwb), and harmonic expansion/compression (103 x 6). 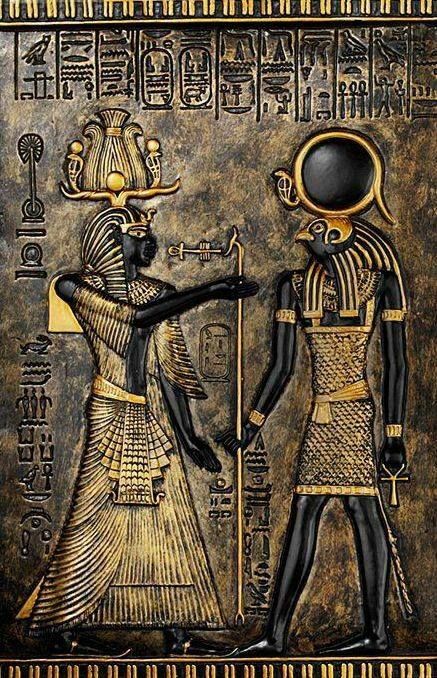 Hence, Nuwaubu as a word and living idea is in the creation and expresses beauty and the wonderful work of EL Kuluwm, Pa Temt Ta (The All) in a way that allows one to re-connect with the active side of reality. This is the other side of Nuwaubu. Yaa Huu Yaa 'Alyun. 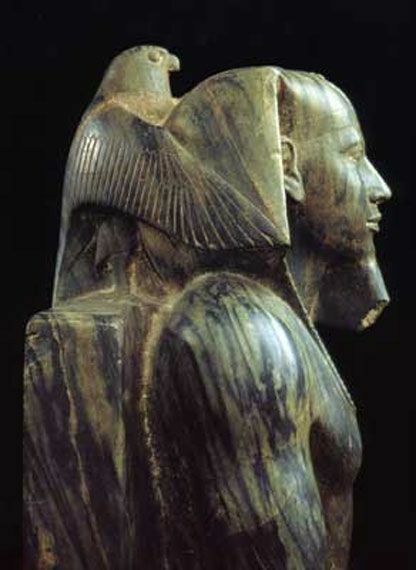 Question: What or where is the other side of Nuwaubu? There is a bridge that links the static and the active and it is that of beauty or aesthetics (nefer). At the heart of beauty is the golden ratio. The various schools, ceremonies, language (nuwb saphah), and activities of Nuwaubu, has given wings to those pure of heart (mukhlis); and have allowed them to exit (magaraj) this earthly realm and cross over (‘ibree) that bridge from the static and into the active side of reality. Nonetheless, they must eventually return and bring some of that vibrant energy into the inertness of everyday living of this earthly realm (naasuwt). Yaa Hayyu Yaa ‘Alyun. Last edited by Pa Neter Ra; at 11:27 AM.. 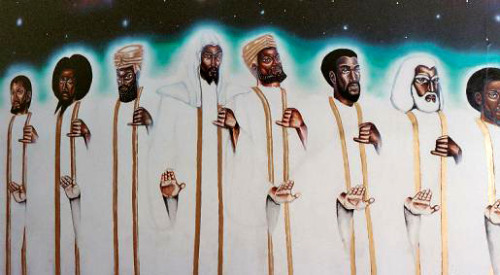 Question: What role has Nuwaubu performed in the creation? 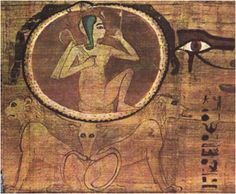 Nuwaubu is the conveyance of a light message; thus, giving rise to sound right reason. 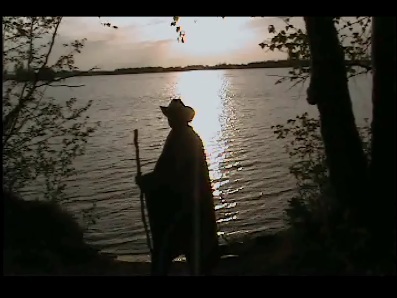 The message is life itself and the conveyor of the message is existence and the continuation of the message (Yaanuwn). Moreover, Nuwaubu informs its descendants that there were three phases in the creation: (a) Primary, (b) Secondary, and (c) Tertiary. 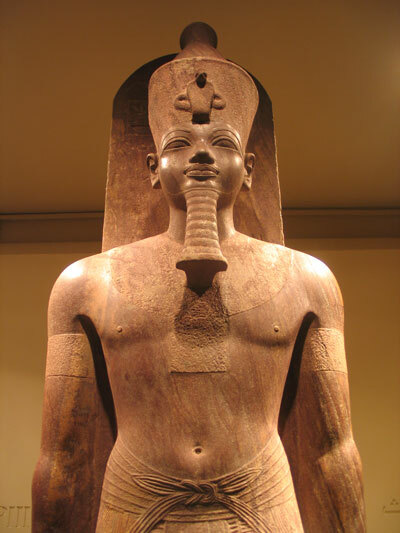 Melanin-ites, for instance, are the incarnation of the original creative force (Hu). Melanin-ites created the worlds in their etheric form, which is the ingredient of stars, suns, and planets. From these conscious and moral substances, melanin-ites incarnated as flesh and blood beings known as Nuwaubians. Incarnated were seven species (tribes/clans) of Nuwaubians. Yaa Nuwn Yaa ‘Alyun! Last edited by Pa Neter Ra; at 11:54 AM.. In Nuwaubu, the science of growth and development, Yaanuwn is the 19th of the twenty and four elders. The number 19 is a centered hexagonal number. All centered hexagonal numbers such as 1, 7, 19, 37, 61, 91, 127, 169…547... are geometrically perfect in economizing light, space, matter, and time. For instance, the total of all 78 digits revealed by the equation 9^9^9 is 342, which is a multiple of the number 19. Therefore, “over it are nineteen” (Qura’an 74:30). The word “Yaanuwn” contains the base word NUWN. In Aramaic-Hebrew, nuwn is a primitive root and it means to “resprout,” that is “to propagate by shoots.” Figuratively speaking, nuwn emphasizes perpetuance or continuance in existence. Green plant life, for example, grows by the propagation of a shoot system. Shoots focus on the above-ground business of the plant. The shoot system enables a plant to grow taller so that it can gain more access to energy filled light messages and grant the plant the means to transform light energy into chemical energy of carbohydrates, which can then be utilized more efficiently for growth and repair. Question: What enables green plants to gain access to light messages? Chlorophyll. Chlorophyll gives green plant life the ability to trap wavelengths of red and blue light; nonetheless, it liberates wavelengths kin to green light. Question: What is the wavelength of green light? The wavelength for green light is 547 nanometers. Like the number 19, the number 547 is also a centered hexagonal number that conveys the theme of economizing light, space, matter, and time. 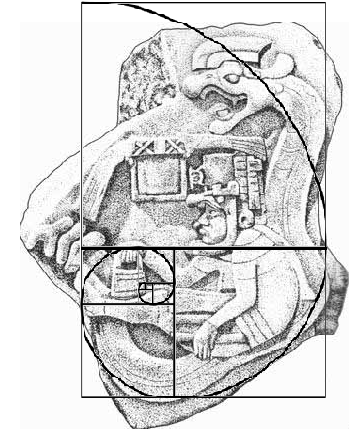 In the Popol Vuh of the Kache Maya, the reader learns that in the immobility and silence of space, matter, and time (SMAT) dwelled the forefathers and foremothers. In the water they were concealed by the blue-green light. 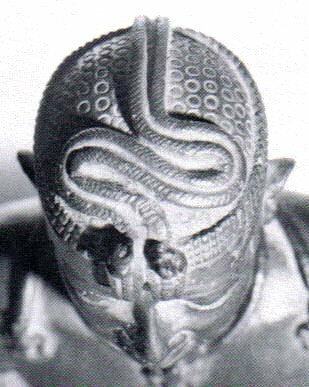 By nature, they were great thinkers and sagacious beings and were thus known as the Royal Serpents. Question: What comprises a shoot system for plants? A plant has two organ systems: The shoot system and the root system. The shoot system, for instance, extends above ground and comprises the organs such as leaves, buds, stems, flowers, and fruits. The pattern of the shoot system is fractal in design. I call this fractalization: NUWN GEOMETRY. Question: What is NUWN GEOMETRY? Nuwn geometry is the continuation or perpetuation in existence. Moreover, nuwn is the idea of continuing to a new generation i.e. HEIRSHIP. Last edited by Pa Neter Ra; at 05:17 PM.. Question: What other patterns or wisdom can one gather from the centered hexagonal numbers? As one can see, the centered hexagonal numbers are produced by the six-multiplication table. For instance, the first 20 centered hexagonal numbers are produced by stages of the numeral six. The number seven is six (6 x 1) more than the number one; the number 19 is twelve (6 x 2) more than the number seven; the number 37 is eighteen (6 x 3) more than the number 19; and the number 1141 is 114 (19 x 6) more than the number 1027. Geometrically speaking, the centered hexagonal numbers communicate nested or tessellated shapes in the form of hexagons and each simple shape has internal angles that total 720 degrees (43,200 minutes of arc). In addition, one can see that the pattern 1-7-9-7-1 is apparent throughout the numerical sequence. The number nine is at the heart of this pattern and the centered hexagonal numbers one and seven are mirrored or reflected about that center. Question: Why is the number 9 at the heart of these centered hexagonal numbers? The number 9 is the numeric chiasm, the ring structure in consciousness. I have shown this feature by way of the multiplication table of the number nine, where decussation (nibiru, the crossing) happens between the products 9 x 5 = 45 and 9 x 6 = 54. From the product and sum of the pattern 1-7-9-7-1, the values 441 and 25 are produced respectively. Both values are Centered Octagonal Numbers. 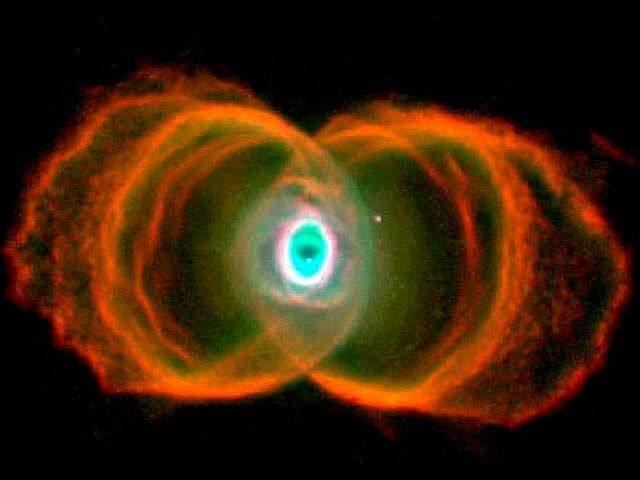 NIBIRU is the crossing or ring structure in consciousness. 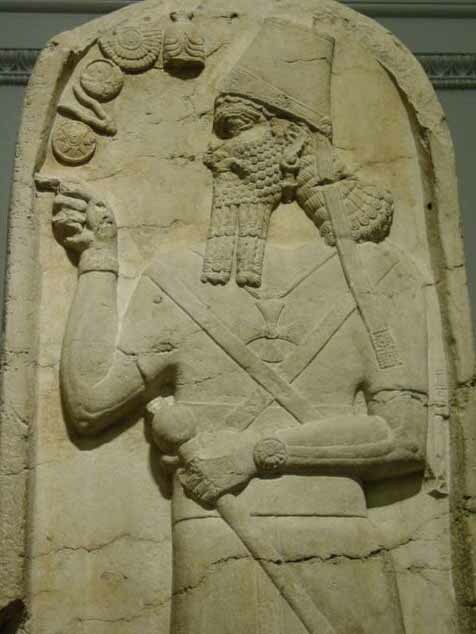 Those that have crossed over are now returning to facilitate changes (scientific revolutions/paradigm shifts) on this planet that mortals have now call Earth (Eridu). The opening of the equation nine to the ninth power of nine has signaled the paradigm shift in AD 1999, according to the Gregorian reckoning system. The Time is Now! Last edited by Pa Neter Ra; at 08:10 PM.. Question: What is a scientific revolution or paradigm shift? Scientific revolution occurs when normal-scientific traditions changes and therefore the scientist(s) perception of his or her world or environment must be educated anew. A paradigm shift(s) come because of changes (revolutions) in normal-scientific traditions or customs. NUWAUPU (9 x 13) or NUWAUBU, the science of sound right reason, is the facilitator for scientific revolution and thereby paradigm shift on this planet that you call Earth (E.ridu, distant home). Nuwaupu has taken fact seekers on a journey through various schools, institutions, disciplines, paradigms, et cetera, so that they may over-stand their cross-purposes and to see and experience a new take on the here and now. Yaa Karuum, Yaa 'Alyun! Question: What do you mean by “so that they may over-stand their cross-purposes and to see and experience a new take on the here and now”? Various schools of thought and customs are essentially paradigms, meaning that they are distinct sets of concepts or thought patterns (shapes) that appear side by side. In due course, these para-digms in SMAT intersect or traverse one another as two circles with common radius traverse one another to reveal the vesica piscis. This unique geometrical lens is considered the template (womb) of various shapes and patterns through and through the great existence. 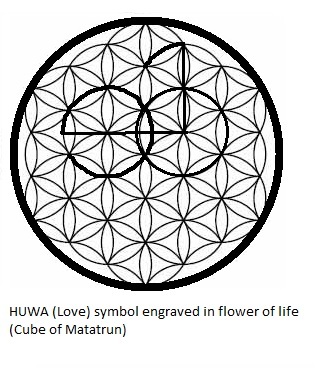 For instance, the vesica piscis is the basic motif in the flower of life (Cube of Matatrun). In it, the symbol HUWA can be inscribed with the vesica piscis holding the idea (thought frequency) together. As you know, the symbol HUWA was created by the letters L-O-V-e or LOVe, which is the sign for DIVINE LOVE. Yaa Razzuq, Yaa 'Alyun! Last edited by Pa Neter Ra; at 05:01 PM.. Question: The idea “DIVINE + LOVE = 63 + 54 = 117 = NUWAUPU = 13 x 9 = MC^2 = ENERGY (The Big Bang)”, is this an equation? The above idea communicates, mathematically, the active side of reality. Etymologically speaking, the word ENERGY means “to be active.” In the natural sciences (e.g., Physics) Energy is a conserved concept. 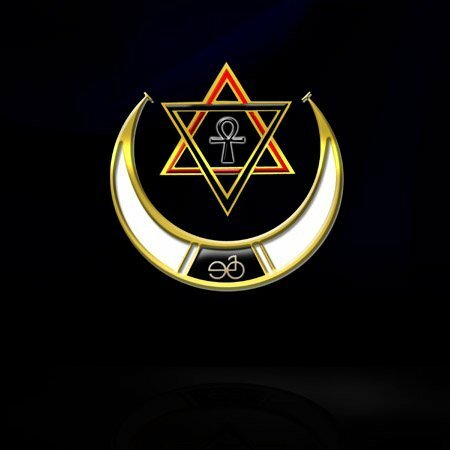 NUWAUPU is a concept that means “to germinate (nuwb or noob).” The germs of the universe or the cosmos are light elements (quantum light, wabanoo), which make up your periodic table of elements by weight, density, crystalline structure, et cetera. These light quanta are glued together by the principle called DIVINE LOVE (‘ishq). In Physics, scientists theorize this strong interaction amongst light quanta to be the GLUON. Question: What is quantum light or light quanta? Quantum light or light quanta are the germs of the universe. God rests in sound right reason and moves in passion. My Cup Runneth Over! Can you expound on the idea: “God rests in sound right reason and moves in passion”? “Your soul is oftentimes a battlefield, upon which your reason and your judgment wage war against your passion and your appetite. Would that I could be the peacemaker in your soul, that I might turn the discord and the rivalry of your elements into oneness and melody. But how shall I, unless you yourselves be also the peacemakers, nay, the lovers of all your elements? I would have you consider your judgment and your appetite even as you would two loved guests in your house.Surely you would not honour one guest above the other; for he who is more mindful of one loses the love and the faith of both. And when the storm comes, and the mighty wind shakes the forest, and thunder and lightning proclaim the majesty of the sky, -- then let your heart say in awe, "God moves in passion." NUWAUPU is sound right reason. It can be compared to the scientific notion of static or potential energy (God's Sphere). In addition, DIVINE LOVE is passion. It can be compared to the scientific notion of dynamic or kinetic energy (God's Forest). Both notions are varying aspects of the same thing and yet these notions are conserved in the scientific idea called ENERGY (God’s Sphere, God's Forest). May the Great Spirit (Kache Manitou) continue to breathe life into our good thoughts! Last edited by Pa Neter Ra; at 08:05 PM..